Genvoya - A New 4-Drug Combination for HIV | The Medical Letter, Inc. ADVERSE EFFECTS – In the two double-blind trials, the most common adverse effects with Genvoya were similar to those with Stribild, and included nausea, diarrhea, headache, and fatigue. LDL-cholesterol levels >190 mg/dL were recorded in 5% of patients taking Genvoya and in 2% of those taking Stribild. Immune reconstitution syndrome can occur with use of any antiretroviral regimen. Cobicistat inhibits creatinine secretion, resulting in an increase in serum creatinine and a corresponding decrease in estimated GFR and CrCl, but actual GFR is not affected. Since both emtricitabine and tenofovir are active against the hepatitis B virus (HBV), patients co-infected with HIV and HBV may experience a flare of hepatitis if Genvoya is discontinued. PREGNANCY — Genvoya is classified as category B (no evidence of risk in animals; no adequate studies in women) for use during pregnancy. DRUG INTERACTIONS — Antacids can interfere with the absorption of elvitegravir and should not be taken within 2 hours of Genvoya. Cobicistat is an inhibitor of CYP3A and CYP2D6 and of the transporters P-glycoprotein (P-gp), breast cancer resistance protein (BCRP), and organic anion transporting peptide (OATP) 1B1 and 1B3. Coadministration of Genvoya with substrates of these pathways may increase serum concentrations of those drugs; Genvoya is contraindicated for use with drugs such as simvastatin (Zocor, and generics) and oral midazolam (Versed, and generics) that are highly dependent on CYP3A for clearance and can cause serious or life-threatening adverse effects at high serum concentrations. Elvitegravir is an inducer of CYP2C9 and may decrease serum concentrations of CYP2C9 substrates such as warfarin (Coumadin, and others). DOSAGE AND ADMINISTRATION — The recommended dosage of Genvoya in patients ≥12 years old who weigh ≥35 kg is one tablet taken once daily with food. The combination should not be used in patients with a CrCl <30 mL/min. CONCLUSION — Genvoya, an INSTI-based fixed-dose combination of elvitegravir, cobicistat, emtricitabine, and tenofovir alafenamide, is an effective first-line treatment for HIV-1 infection. It appears to be safer than Stribild because tenofovir alafenamide is less likely than tenofovir disoproxil fumarate to cause renal dysfunction or decrease bone mineral density. Panel of Antiretroviral Guidelines for Adults and Adolescents. Guidelines for the use of antiretroviral agents in HIV-1-infected adults and adolescents. Department of Health and Human Services. Available at: aidsinfo.nih.gov. Accessed February 4, 2016. 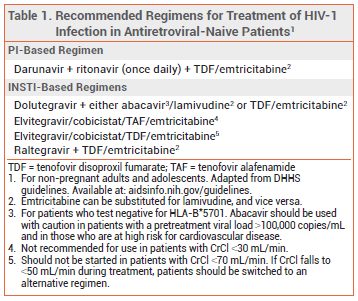 HHS Panel on Antiretroviral Guidelines for Adults and Adolescents includes a fixed-dose combination of elvitegravir/cobicistat/emtricitabine/tenofovir alafenamide among the recommended regimens for antiretroviral treatment-naive Individuals with HIV-1 infection. November 18, 2015. Available at: aidsinfo.nih.gov. Accessed February 4, 2016. D Wohl et al. A randomized, double-blind comparison of tenofovir alafenamide (TAF) vs. tenofovir disoproxil fumarate (TDF), each coformulated with elvitegravir, cobicistat, and emtricitabine (E/C/F) for initial HIV-1 treatment: week 96 results. J Acquir Immune Defic Syndr 2016 January 29 (epub). A Mills et al. Switching from tenofovir disoproxil fumarate to tenofovir alafenamide in antiretroviral regimens for virologically suppressed adults with HIV-1 infection: a randomised, active-controlled, multicentre, open-label, phase 3, non-inferiority study. Lancet Infect Dis 2016; 16:43.